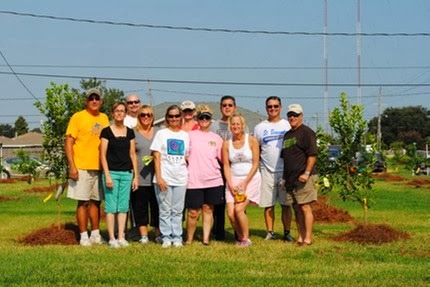 Concerned Citizens Around Murphy is an association of residents whose members are dedicated to revitalize St. Bernard Parish and renew the environment through public participation and resident advocacy. Philanthropy is commendable, but it must not cause the philanthropist to overlook the circumstances of economic injustice which make philanthropy necessary. ---- Martin Luther King, Jr.
UPDATE: The Council meeting was well attended by members of the local fire department which still struggles with its budget and at times has closed fire stations, sometimes on a rotating basis. The local fire department seeks to receive a portion of the Hotel Motel tax, and the council passed a resolution to begin legislation to put that issue to a vote of the people. 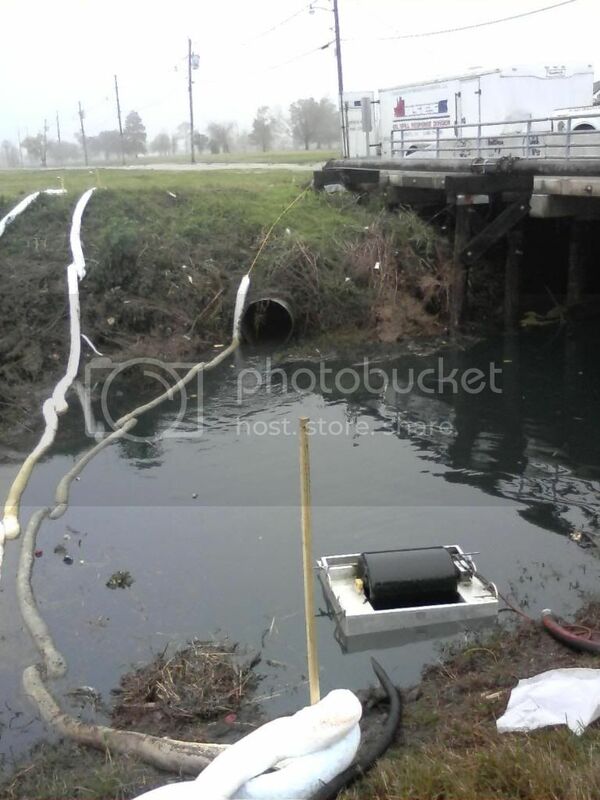 It would be interesting to learn if the St Bernard Parish Fire Department supports granting or denying Industrial Tax Exemptions (ITEPs), or if the Lake Borgne Basin Levee District might deny their portion of the exemption and finally maintain the rain drainage canals consistently and responsibly. The Port of St Bernard also has a property milleage which it can grant or deny an exemption for this industry. . The Council’s two motions to deny the ITEPs applications on the agenda were both passed. The Council approved an “abuse addiction treatment facility” in a school zone, in the heart of a neighborhood friendly business corridor. The school zone is for the community’s only high school and students who live in this neighborhood walk to high school because of the close proximity. It is unclear whether this treatment facility will address the growing number of drug overdose deaths in our community or if it will be a pill factory which increases the drug trafficking in a school zone. There were other ordinances passed, most without discussion or comment, and the agenda contains so little information it is impossible to know what decisions were made. Tuesday February 5 2019 St Bernard Parish Council public meeting on two Industrial Tax Exemption applications (ITEPs). There is no available information at this time on the Council's agenda except the application number. There is no indication which industry is the applicant, what is the scope of the project, the amount of the tax exemption, the cost - benefit analysis; nothing. It will be interesting to learn how a local council can make such a decision without information; unless it is available to the council and not the general public, even upon request. Just another example of the lack of transparency, lack of equal access to all the information before the decisions are made. But its not surprising. Last month, the local Baton Rouge, La school board voted against granting ExxonMobil two property tax breaks,"one for work at its Baton Rouge refinery and another at its polyolefins plant." "The company was seeking exemptions from school property taxes worth about $2.9 million over 10 years. The work in question was completed in 2017, and ExxonMobil had a difficult time explaining while it still need a tax break for them." Also not surprisingly, Louisiana legislators seek to pass legislation which will take away the local decision making , even though these tax exemptions come out of the local budgets. Shall Article II, Section 2-01.1 of the Home Rule Charter of the Parish of St. Bernard, State of Louisiana, be amended to read as follows: (a) A person who has served as a councilman representing a councilmanic district for more than two and one-half (2 1/2) terms in three (3) consecutive terms may not qualify for the office of councilman representing a councilmanic district for the next succeeding term; (b) A person who has served as a councilman-at-large for more than two and one-half (2 1/2) terms in three (3) consecutive terms shall not qualify for the office of councilman-at-large for the next succeeding term; (c) This section shall apply to each initial persons elected as councilmen or councilmen-at-large and to all subsequent persons elected to the aforesaid offices under this charter? According to a Together Baton Rouge Report's ITEP Search Tool , the industrial tax exemptions in St Bernard Parish could afford us to keep our fire stations open. Our budgets might change such that we could also give our school board employees and teachers a long awaited pay raise, and continue to fully fund all of our parish pension’s obligations, without being asked for more sales and property taxes. We could fund drinking water improvements, along with improvements to roads and bridges, pedestrian cross walks, fishing piers, drainage and sewerage improvements, grass cutting and canal maintenance, books for our libraries, art and stem initiatives, recycling and composting, farm to table initiatives, bicycle and walking paths, public transportation, healthcare access, workforce development, free adult lifetime learning courses, senior citizen outreach, parks and recreation programs, criminal justice reforms and re-entry programs, affordable housing, and on and on. Come on St Bernard, we can do better than this. Our community would also benefit if more and more parish workers and school board employees returned from the north shore and actually lived in St Bernard Parish and contributed to our economy base. 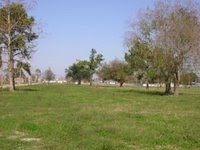 The public sector in St Bernard Parish is said to be the larger employer: fire department, sheriff department, school board and teachers, parish government workers, public works employees, state judicial court, justice of peace, constables, lake borgne basin levee employees, St Bernard Port, St Bernard Parish Hospital, etc. And then there are all the out of parish (sometimes out of state) workers at the large industrialized plants which are the benefactors of all these exemptions. Our community would benefit greatly if the majority of all these jobs were actually domiciled jobs. The following DEQ air monitoring site(s) have detected elevated readings which have reached an "Orange" or "Red" level on the Air Quality Index (AQI). According to the Environmental Protection Agency, who sets most air quality standards, being at the "Orange" level means that levels are "Unhealthy for sensitive groups - People with asthma should consider reducing exertion outdoors", while a "Red" level is "Unhealthy - Children, asthmatics, and people with heart or lung disease should reduce exertion outdoors". This data has not been quality reviewed or validated. Continuous PM2.5 readings shown are not NAAQS comparable. If you would like to stop receiving these messages, please Unsubscribe. 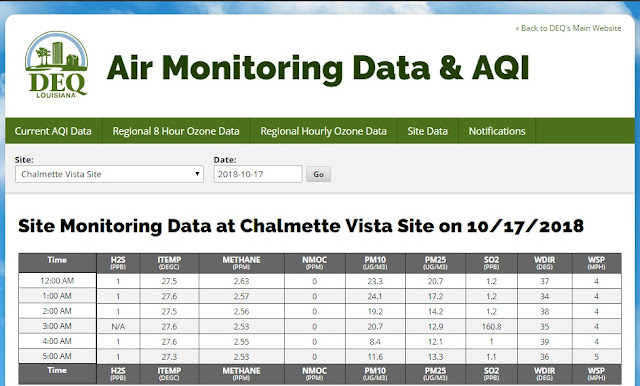 CORRECTION: The LDEQ sent AQI Exceedance Notifications twice this week for Sulfur Dioxide levels in Chalmette Vista neighborhood. Both readings were at 3AM and have been changed to N/A for calibration of monitor. 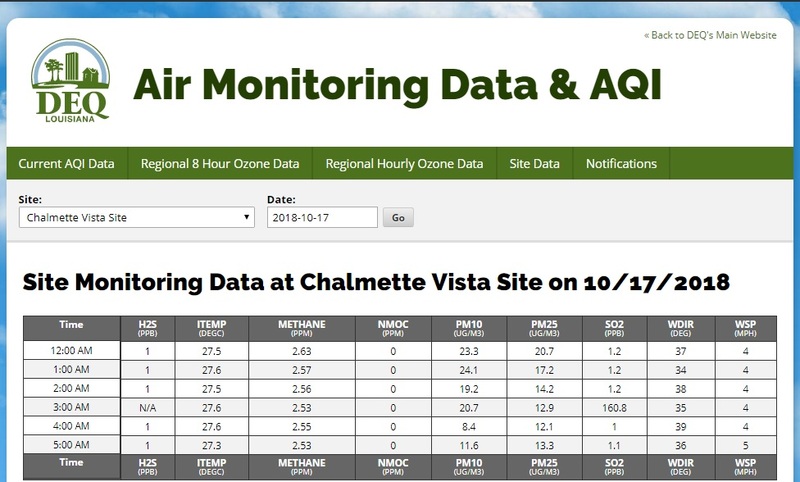 Just when residents thought it was safe to leave the windows open with the cool Fall temperatures, the LDEQ sent out a notification when the Sulfur Dioxide reading spiked over night and reached a one-hour average of over 155 parts per billion The EPA health standard for sulfur dioxide is 75 ppb SO2. Sulfur Dioxide at the 12 ppb SO2 level triggers headaches and other adverse effects. The Louisiana DEQ issued an exceedance notice about the air quality being unhealth for sensitive groups: Sensitive Groups are CHILDREN, the elderly, & ACTIVE ADULTS. It will be of little avail to the people that the laws are made by men of their own choice if the laws be so voluminous that they cannot be read, or so incoherent that they cannot be understood; if they be repealed or revised before they are promulgated, or undergo such incessant changes that no man, who knows what the law is today, can guess what it will be tomorrow. Law is defined to be a rule of action; but how can that be a rule, which is little known, and less fixed?" opportunity to hold Dow and the EPA accountable slip away. As part of our on-going testing of our readiness capabilities, St. Bernard Parish Office of Homeland Security and Emergency Preparedness will conduct a test of its Emergency Siren System on Wednesday, November 20, 2013 at approximately 1:00 p. m. The test will last for approximately 3 minutes. This test will also include a broadcast on our AM radio station. The broadcast can be heard on 1680-AM radio. Register for St. Bernard Parish SO2 Email Notifications. When S02 levels are recorded that are considered Unhealthy for Sensitive Groups (76 ppb or above) in St. Bernard Parish, you can sign up on LDEQ's website to receive email notifications. Earth Justice takes action to compel EPA to act to protect people from the residual risk of exposure. 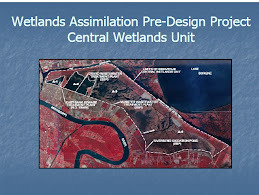 The St. Bernard Parish Government is proposing a new parish-wide Master Land Use Plan. Funding for this endeavor may be the Murphy Oil Crude Oil Spill "Cy Pres" Fund, according to the former Chairman of the Planning Commission. Councilmembers indicated they would have community meetings in each district for resident input and public information on the proposed changes to zoning and landuse throughout the parish. If you ever want to end democracy and destroy America, you begin by denying citizens the chance at accessing information and opportunities for education. A people who cannot learn will always be oppressed -- just look at everywhere from Soviet Russia to North Korea. The waste water treatment plant design requires flows to the ponds and canals which will never fully meet LPDES requirements. [*] This is a violation of the Clean Water Act. 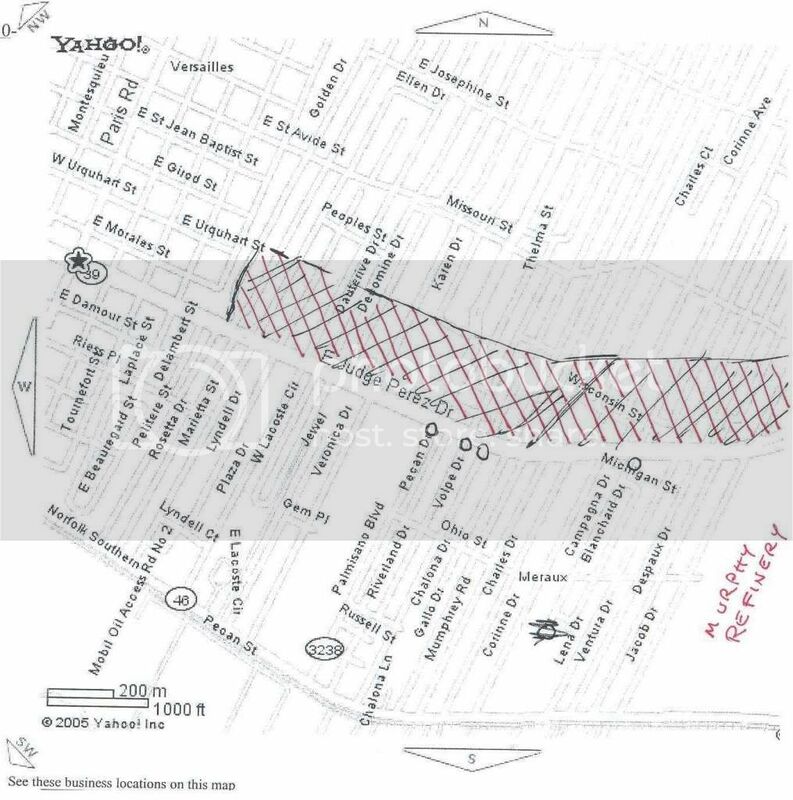 In fact, the permit does not require sampling of the waste flow from the waste treatment facilities (south of Judge Perez) to the conveyance ditch which feeds the ponds (north of Judge Perez). The only sample of this flow is after it has been diluted with the ponds and before it is discharged into the local canals. The applicant should be prohibited from ever sending chemicals or waste waters to any of the canals. The permit should prohibit -- under any conditions -- ever sending waste flows north of Judge Perez to the earthen conveyance ditches, storm water ponds or basins interconnected to the ponds, because any chemicals and materials sent north of the waste treatment facility goes into our neighborhoods and sensitive Central Wetlands. The permit should prohibit storage and treatment of wastes north of Judge Perez. Once the refinery wastes are sent to the Secondary stormwater basins or ponds, it is impossible to send it back for treatment, because, by that time, it is already mixed with the pond's water. 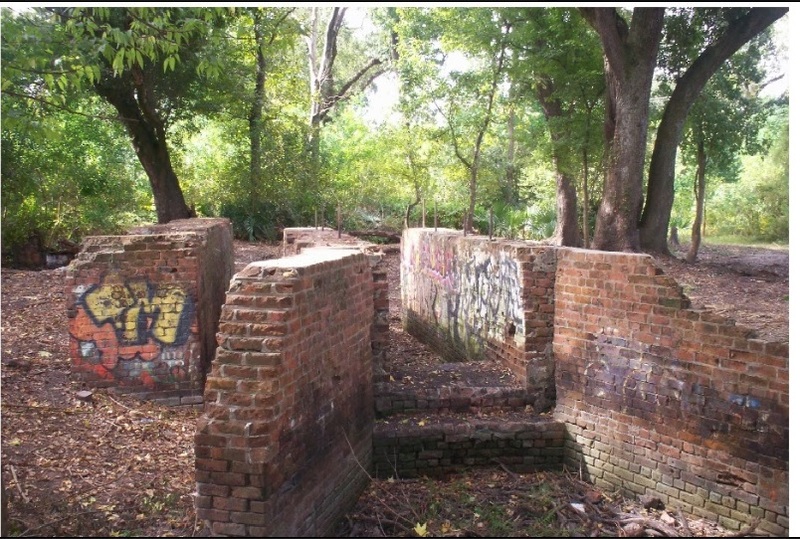 The ponds discharge into the local canals, which meander through neighborhoods before discharging in the sensitive Central Wetlands, Bayou Bienvenue, and Lake Bornge. The plan to prevent the refinery process campus from flooding is to release process campus storm water through the same route; if there is a backup of storm water on the process campus, it overflows onto residential streets. The requirement to maintain the ponds with adequate freeboard is sometimes met with similar discharges. The design of the waste treatment facilities, when it rains or malfunctions is to store the harmful chemicals and wastes in an unlined ditch within very close proximity to a Church which hosts vacation bible school for children. 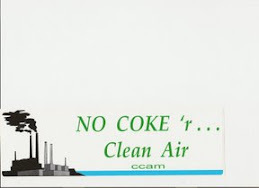 It is impossible to send all the contaminants back from the ponds to the waste treatment facility for treatment and all these wastes and chemicals are eventually discharged into our neighborhoods or released into our air. And it's completely avoidable by segregating process water and waste streams from storm water and instead piping malfunctions and "emergency" discharges to storage tanks, treatment ponds on the river side (away from human inhabitants), or into the river itself. Allowing storage and partial treatment of the wastes in the storm water ponds exposes our residents to harmful and carcinogenic chemicals. Discharges have a lasting effect on the estuaries and environment. DEQ must consider alternatives to sending chemicals and wastes into the canals and alternatives to storage of chemicals and wastes north of Judge Perez. DEQ concluded (page 80) that by providing personal income for the facility's permanent and contract employees outweigh the environmental costs. The LDEQ will conduct a public meeting, followed by a public hearing, on Thursday November 10, 2011 at 6pm in the Council Meeting Room. The Question and Answer meeting on the Murphy/Valero water discharge permit should answer community concerns about the oily discharges into the neighborhood canals. The monthly public meetings are open to the public and scheduled to convene on the third Tuesday of the month at the former Murphy Oil Administration Building, 1615 East Judge Perez Drive in Chalmette. .
Murphy Oil has also provided computer access in the public library. 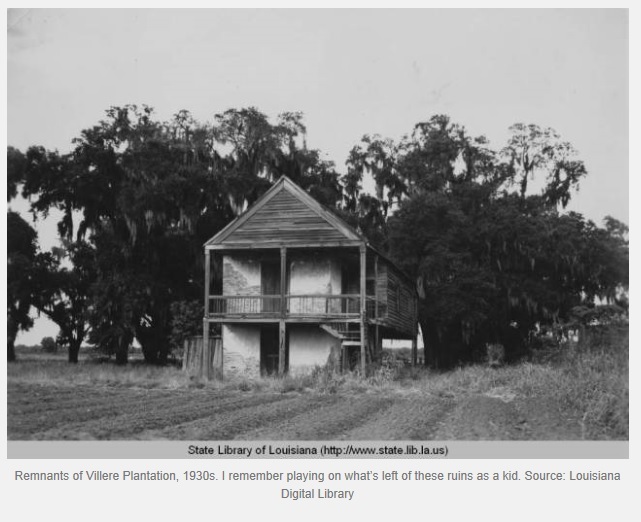 The Villere Plantation was listed as a War of 1812 Preservation Priority in the 2007 American Battlefield Protection Program Report to Congress. 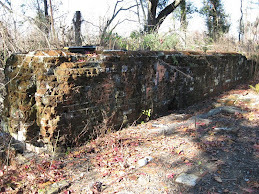 "The priorities indicate which sites, in the opinion of the National Park Service, merit immediate preservation action, which need ongoing preservation action, which require additional study, and which are best suited for commemoration rather than preservation." 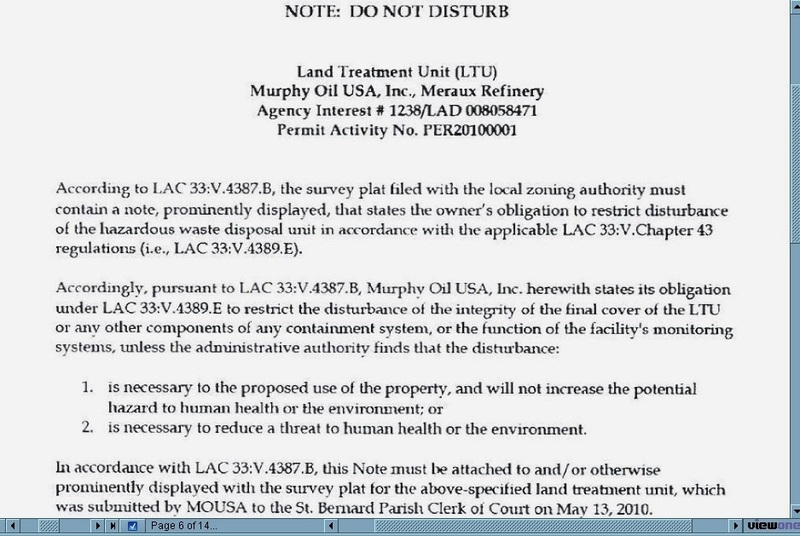 The recent EPA Consent Decree with Murphy Oil agreed to a conservation servitude for the Villere Plantation land area of the crop fields drainage machine. The conservation servitude unfortunately expires in approximately 7 to 10 years along with the consent decree. 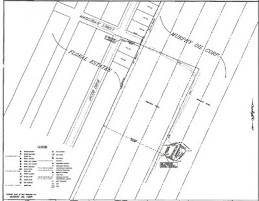 The Louisiana Historic Preservation Office has approved Levees.org 's request for a second historic plaque, which will be positioned near ground zero of the London Avenue Canal Breach site (Mirabeau and Warrington) in the Gentilly neighborhood of New Orleans. Amnesty International: U S Congress urged to amend Stafford Act to guarantee humane and fair treatment of all disaster victims....allow victims to "return voluntarily, in safety and with dignity, to their homes" or "resettle voluntarily".....to " be allowed full participation in the planning and management of their return or resettlement"
With children out on summer break and the lack of sidewalks on this street, residents have requested SBPG Public Works properly fill this five foot hole. 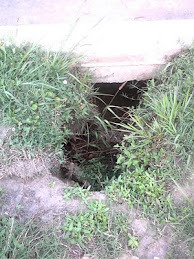 Any child could easy explore under the street and with the lack of sidewalks, anyone could easily be hurt. NOTE: As of Summer 2011, this situation has not been remedied. 2005 oil release Science For Sale August 2006 by the Louisiana Bucket Brigade: "Science for Sale: How Murphy Oil, USA and the Center for Toxicology and Environmental Health have downplayed risks from Murphy's million gallon oil spill in St. Bernard Parish"
We need block captains to help survey district for compilance violations. 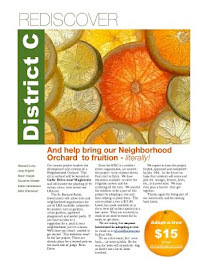 There is more information on the website http://www.rediscoverdistrictc.com/ . The French get all the attention in South Louisiana. But the Islenos -- literally, Islanders -- have just as rich a history and culture. 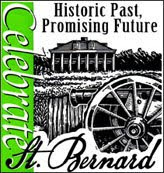 The colonial government of New Spain brought some 3,000 of them here from the Canary Islands between 1778 and 1783, to colonize the wild swamplands of St. Bernard Parish and serve as a frontier militia against British encroachment. 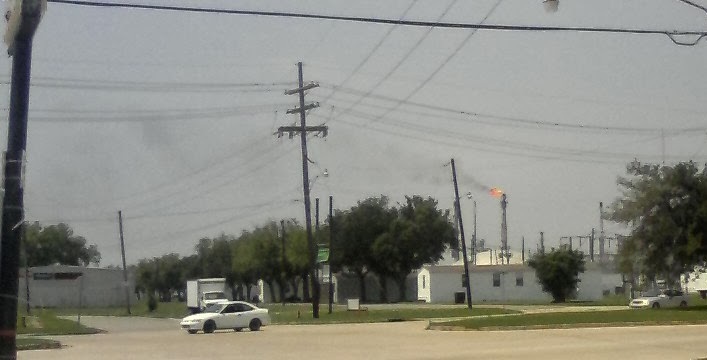 The neighborhoods around Murphy Oil's Louisiana refinery in Meraux have been revitalized since as early as Fall 2005 and are a vibrant part of the Southeast Louisiana community of St Bernard Parish which has experienced rapid repopulation and rebuilding, due to the spirit and commitment of returning residents. 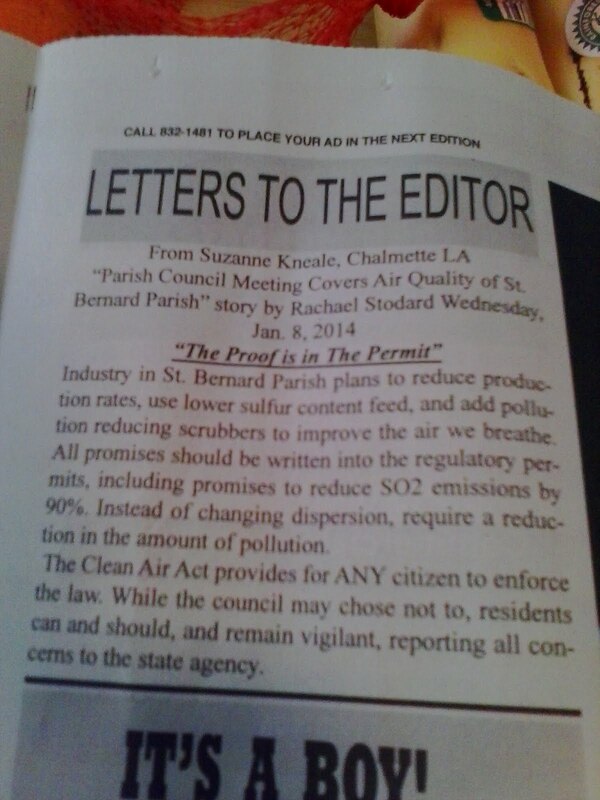 We want what any other St. Bernard Parish neighborhood would want; clean air, clean water, and uncontaminated soil; and for families and friends to live peaceful lives. As we restore our homes and revitalize our community we are preserving the integrity of our residential neighborhoods and improving our quality of life. A petition is being circulated asking the St. Bernard Parish Council and Administration to oppose the sale of the Jacob Drive Fire Station to Murphy Oil Meraux Refinery. 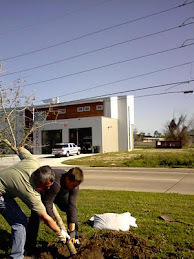 Comprehensive plans based on Fire Insurance Rating Determinations for the placement of Fire Stations throughout St Bernard Parish are paramount to both fire protection level and 'first responder' response time and should be the predominate factor in this decision. Because these determinations are not yet available since the August 28, 2007 fire rating review, Summary No. 2037 has been tabled since August 2007 (see item #15 on the Agenda 08/21/07 ). Should the Jacob Drive Firestation ever be taken out of service, the property should not be sold to the Murphy Oil Meraux Refinery for Expansion of facilities. 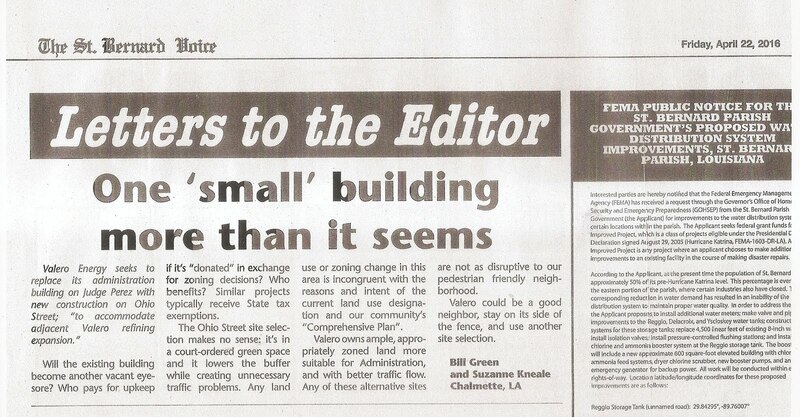 Please join us in opposing this sale by signing the petition and contacting your council representative. Fire Protection Level and 'first responder' response time are a priority. Remember, the house you save may be your own. Your time and attention to this ongoing sediment problem is appreciated. To our knowledge those properties on Lena Drive South were never seeded. For the life of me I cant understand why they just wont plant grass already; or at least grass seeds or plant grass sodding on the curb side of the property (in accordance with local parish ordinances which no parsh compliance officer seems to want to enforce on this project). Regardless, your efforts within your jurisdiction should bring a solution that residents have been asking for since the summer; keep the mud out the street and especially out of the storm drains. Please keep in mind that what the corporation terms a buyout zone, we call home. 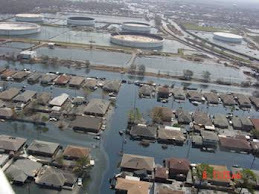 It is our neighborhood, revitalized since the flood and crude oil spill. It is not a construction zone and its not for sale. Its a subdivision and we expect this corporation and its employees to demonstrate the same level of respect to its new neighbors that it would want in their own hometowns (where ever that maybe).